A kilowatt-hour is the standard unit used by suppliers to measure your consumption. 1kwh is equal to 1,000 watts and refers to the use of power over a period of time. A supplier’s unit rate can depend on the amount of kwh you use. Your electricity meter uses kwh to measure consumption whereas a gas meter uses cubic meters or cubic feet as the standard unit which would need to be converted to kwh. The formula can be found on your bill or see below a general calculation. The formula for old imperial meters is: metered units x 2.83 x1.02264 x calorific value (varies but usually between 39-40)/3.6 for the newer metric meters you omit the multiplication of 2.83 so it’s just: metered units x1.02264 x calorific value (varies but usually between 39-40)/3.6. A bill from your current supplier will show your usage in kWh. 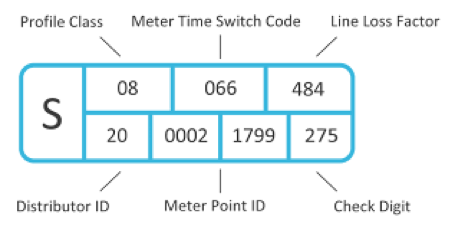 The meter point ID for gas meters. This number is printed on your gas bill but does not display on your meter. If you don’t know it i.e. you just moved into a new property you can call the MPR enquiry line on 0870 608 1524 to find out. The number stamped on the front of the meter. This changes when meter is exchanged. It is often printed on your bill for identification purposes but not normally used in any correspondence though you may be asked to provide it in some forms. This is a measure of heating power and is dependent upon the composition of the gas and refers to the amount of energy released when a known volume of gas is completely combusted under specific conditions. It is measured in joules per kilogram. The actual figure can vary slightly according to the atmosphere and distribution zone. The figure stated on the bill is an average for the billing period. A half-hourly meter is one which measures your usage in half-hourly increments throughout the day. Normally this is a new meter or a communication device connected to the meter which allows the data collector to remotely connect to the meter, obtaining consumption. The supplier will then receive this information from the data collector and bill the client accordingly. A HH meter is required for any site using a reserved amount of kVA. P272 legislation requires all former Max Demand meters to be transitioned to HH metering; this law came into play in April 2017 and continues to be implemented. HHD is the product of the half-hour meter. This is sent to the relevant supplier via a remote SIM card or a fixed BT line. The data is usually made available to end users by way of a spreadsheet. A full years’ half-hour data will be a spreadsheet that runs 48 columns across (for every half-hour) and 365 rows down (for every day). This information is needed by the supplier when you request a quote for a HH metered site. kVA stands for kilovolt-ampere and refers to the limit of capacity for a site. Customers pay a fee (per unit) according to the agreed capacity for that site. One kVA equals 1,000 watts of power and there is no direct link between kVA requirements and annual energy usage. For example, two buildings use 100,000 kwh annually but one uses equipment with a larger power requirement for an hour a day and the other uses less powerful equipment for a longer period. They both use the same energy, but the first building requires more power as there will be more energy transferred to the building in a short space of time. kVA charges are also known as capacity charges and are outlined below. The maximum electrical load a customer may use in the property as agreed with the local Distribution Network Operator (DNO). A set charge by the local Distribution Network Operator (DNO) for investment and maintenance of the electricity network, based on the Agreed Capacity of a property. This can also be called the Availability Charge. Note that exceeding the amount of agreed capacity will lead to excess capacity charges which can cost up to three times the usual rate for consumption over your kVA. The new legislation introduced by Ofgem which covers excess capacity charges is called DCP161. The organisation appointed to maintain metering equipment. HH customers are required to agree an MOP contract, which usually runs for 3 or 5 years. If no separate MOP contract has been agreed, the supplier will implement default costs, which can be 100% more than a contract directly with a meter operator. Renewable energy is used to describe the energy produced using naturally replenishing resources. This includes solar power, wind, wave and tide and hydroelectricity. Wood, straw and waste are often called solid renewable energy, while landfill gas and sewerage gas can be described as gaseous renewables. This is when the the current supplier stops the supply transferring to a new supplier due to still being in a contracted period, absence of valid termination, or if there is an outstanding balance on the account. Some suppliers will implement a Take or pay, otherwise known as Tolerance clauses which can be set as anything from as low banding of 90%-110% of agreed usage up to 70%-130%. This varies from supplier to supplier and is mostly only implemented for Industrial and Commercial sized meters or contracts, not SME. If you are planning to close down a site, reduce the capacity or extend and expand then these clauses need to be checked prior to entering a contract. In actual fact, few suppliers enact this but it is prudent to check these. This is the main government market mechanism to support renewable energy. It is an obligation on all electricity suppliers to supply a certain amount of their electricity sales from accredited renewable sources under the Climate Change Levy exemption scheme. As they are not predictable for long time ahead some suppliers will list them separately on the bill and/or pass on to the customer any increases. This is the main government market mechanism to support renewable energy by private investors. Home and business owners who install renewable energy generators such as solar panels receive a high pay-back for the electricity generated, which is fed-into-the system or used locally. Hence the name Feed-in-Tariff. Electricity consumers are obliged to contribute towards the cost of installation of renewable energy by way of sharing the total cost paid out as FiT. As they are not predictable before the quarterly reconciliation, some suppliers will list them separately on the bill an estimated amount and/or reconcile when the final figures are available. The Government has introduced new measures to ensure the UK’s future electricity supply is reliable and will meet our targets for the reduction in carbon emissions whilst minimising costs for customers. The measures and associated legislation is collectively called Electricity Market Reform (EMR). EMR includes both new incentive schemes for low carbon generation and the provision of generating capacity to ensure that the UK continues to have a reliable supply of power. For gas and/or electricity supply agreements, it has fewer than 10 employees (or the full time equivalent of it) and an annual turnover or annual balance sheet total of less than €2m. A microbusiness has similar legal protections as a domestic contract in particular regarding the renewal process and has access to the energy ombudsman in case of an unresolved complaint against the supplier.